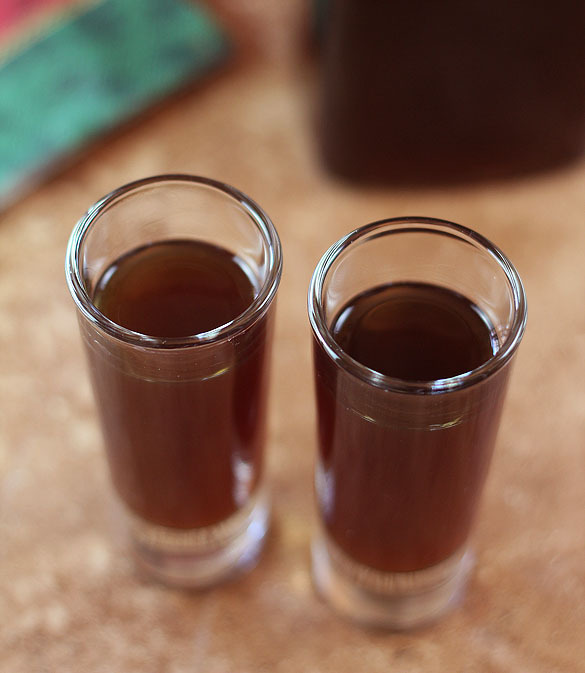 One of the easiest homemade liqueurs is a version of the well known Kahlua. Simply mix some dried coffee with vodka, sugar, and vanilla and wait a couple of weeks and voila…you’ve made Homemade Coffee Liqueur! My youngest daughter Lauren works at Nordstrom’s in their Visual Merchandising department; she is one of the elves that work behind the scenes for weeks in preparation for the big reveal of all things Christmas the day after Thanksgiving. I won’t say it’s not hard for me that we don’t spend the holiday together but I respect Nordstrom’s tradition; it’s so in line with my own. That being said; I struggled with doing a post this week before Thanksgiving that had any mention of Christmas. But…no make that a big BUT; I’m really doing this for you! I decided it was worth jumping the gun a few days than waiting until it’s too late to share this recipe that is the perfect gift for you to give friends and family over the holiday gift giving season. I don’t make my holiday gifts because I’m cheap (promise!) but because I want to put an effort into them that makes the giving personal in a very real sense. Don’t laugh but this year…recipients are getting this coffee liqueur, my version of Biscoff cookies (I’ll share them soon!) and my home cured Maple Bourbon Bacon. Yes, bacon. I want them all to experience how amazing home cured bacon is so yesterday I bought 10 lbs of pork belly which I’ll be curing and smoking and wrapping in one pound packages for gifts. Go on, tell me now if that’s crazy; I’m happy to hang on to all of it for myself! There are a variety of methods I’ve seen for making home brewed Kahlua coffee liqueur. The primary difference in methods is using either coffee grounds in the brew or instant coffee. I’ve done both and personally prefer going the instant coffee route; the year I tried grounds there was no way to remove every bit of them; even pouring it through cheesecloth didn’t completely work if only because some of the heavenly elixir was lost in the cheesecloth. I also like to cook down the sugars and water to get a syrupy consistency before adding the vodka. Is it totally necessary? Not really; just my personal preference and makes it more reminiscent of the real deal. I’ve found that my favorite concoction includes some of my own revisions. I use dried espresso instead of instant coffee; I just think it’s a bit richer as a result. And beyond the standard water, sugars and vodka I add just a touch of chocolate liqueur to the mix; it’s optional and not something you should run out and buy. I make my own chocolate liqueur too so always have some on hand. I often use espresso in a chocolate recipe because they are so compatible with each other so I’ve just done ‘opposite day’ and added a bit of chocolate to this espresso based liqueur. It’s subtle but it’s there and it’s a good addition and I simply love this Homemade Coffee Liqueur (Kahlua)! By the way; I don’t recommend that you use either Everclear or your best vodka for this. Everclear is often recommended but it’s grain alcohol that has such a high proof that many liquor stores won’t even carry it; just look for a bottle of 100 proof vodka (Smirnoff has one). Using great sipping vodka is also not required; save that for your favorite cocktails. Once you mix the vodka with sugars and coffee and let it age a bit; the vodka will mellow out. I usually ask a liquor store for a recommendation and spend around $15 for a 750 ML bottle. NOTE: No, I don’t smoke cigars but my Uncle Eddie did. He and my aunt both passed away this year after a long life together and my cousin sent me some of their possessions. I didn’t want much; all I asked for were a few things that I could use in photos; as a reminder of them. The funny thing is I didn’t think of cigars when I made that request, but one of the things Pat sent me was this old cigar box and it brought back a flood of memories of my Uncle Ed and his cigars. I can see him smoking one now with a coffee liqueur shooter so this one’s for you Ed! I think better even than Kahlua...your own coffee liqueur using espresso. Combine the water, both sugars and dried espresso in a large saucepan over medium-high heat. Bring to a boil; turn the heat to low and simmer for a minimum of 1 hour.to reduce the mixture and make a more syrupy consistency. Watch constantly and stir occasionally. Add vodka, vanilla beans and chocolate liqueur. Pour everything into a storage container. Age for 3-4 weeks in a cool, dark location; stirring once or twice a week. (Note...it's absolutely drinkable earlier; so if you have less time to age it than that; gift it and make a note on the gift tag to wait just a bit). When ready to bottle, remove vanilla beans, bottle mixture and store. I cut up the vanilla beans and add them to some sugar...nothing at all wrong with Kahlua flavored sugar in your coffee! I have already added the alcohol and vanilla and aged it 3 weeks. It is thinner than commercial products but the flavor is what counts. I haven’t tried it because I didn’t think there was a need for it but I’ve thought that if someone wanted this to be thicker they could boil down the sugar and water to get a thicker syrup before it’s added to the other ingredients. It’s just a step that I have never taken so I don’t include that option because I’ve never tested the results. Thank you for this recipe. I look forward to making it. I’ve read through the comments and your responses and didn’t see this question, but I apologize if I’ve overlooked it! I’m trying to sort out what I’ll need to make enough for 18 gifts. I saw that your recipe had a yield of 8, but I wasn’t sure what that 8 represents (servings, bottles, etc.) or the volume of bottles I should buy, especially if I let the water and sugar reduce. Have you doubled/increased your recipe before? If so, did it still turn out well? You can increase it 2 or more times, no problem. That serving business is way off…I’ll have to fix that when im back in the office…thanks for the heads up! I’ve made my coffee liqueur and it is ageing quite nicely. The only question is how thick should it be? I poured a.50 ml serving and it just seems too thick and sweet. By the tablespoon it’s fine, and I poured some into my eggnog and that was yummy! What should I do to thin it out? If I add vodka, that sets me back in the ageing, yes? You can either thin a bit with vodka or water…remember unless you’re consuming it all immediately, the liqueur will continue to age so unless you’re putting in another whole bottle, I don’t think adding a little vodka would hurt. Also remember that Kahlua is sweet and thick too…knowing it will be typically mixed with something else, just take caution to not thin it too much. I think this is my last question, and again I really appreciate how responsive you’ve been!! I actually made two batches, one from the Costco vodka (80 proof) and the only 100 proof vodka I found was Potter’s. This is a low priced vodka ($17 for 1.75 l) which has “4 stage ultra filtration”, and I’d say it’s been ageing since about 12/2. I can definitely taste a difference – Costco is smoother and I believe the taste has improved. Potter’s definitely has a bite to it – maybe it’s improved? I tried mixing a tiny bit of each and that did not help. It’s not awful, although mixed with milk was actually pretty good. I know you said most don’t drink it solo, so do you think I’m okay to give this? Yes. Part of what the time spent does is mellow that vodka. The 100 proof, if given enough time, will also extract more flavor from the elements that are included. I usually buy an inexpensive brand like Smirnoff that’s probably about the same as the Potter’s and I’ve never had complaints. See why I don’t use Everclear? It’s awful if you ask me; actually BURNS. No thanks! I would tell the recipients to leave it alone for two weeks if you’re giving it now; that month matters…even longer is fine too. I don’t mind the questions; glad to help! I am about to attempt this recipe tomorrow and was wondering how I go about bottling prior to the three weeks. I need to give these out next weekend as gifts and I see that you mentioned you can bottle prior an just make note of the date to open. But do I leave the vanilla beans and any sediment in the individual bottles or would I strain them out first? If you separate out all of the good things that the vodka is extracting from for flavor that soon, I fear it will not have the hoped for result. I would normally give some leeway but a full three weeks short? I think you need to bottle with instructions to strain when the time is right. Do you have any suggestions on amounts of vanilla extract for this recipe? I’m making this in bulk and buying whole vanilla bean pods for what I’m making isn’t rationale for me. Or what if I did 1 pod and some amount of extract? Any suggestions you have on amounts would be greatly appreciated! You can substitute One tablespoon of vanilla extract for each vanilla bean Erin without a problem. Enjoy! Arrrggghhhh I’ve made this using the beans which are pricey. Is the flavour really the same if I use 1tbs extract instead? That would certainly reduce the cost? I prefer the vanilla bean Liz but the question was what to use and yes, you can use it. It might not be as potent but it’s to accentuate the flavor so should be fine. I’ve never made it using anything but vanilla beans but I did some research and saw the extract suggested so thought it a good one to mention. I did find two organic vanilla beans for five dollars at sprouts. I don’t know if that store is in your area or not but if so there’s a good option for less expensive beans. Thank you! I really appreciate your quick responses! I am not what anyone would call a fine cook, so I want to be sure I’m understanding terminology correctly. When you say a vanilla bean, you’re referring to the entire pod, as opposed to one bean from within, correct? Thank you, again, and I can’t wait to try this! Yes Erin, exactly. And the directions indicate ‘split’ which means you do want to split them open lengthwise to release those little beans inside. The pod stays in too since there is flavor it in and it’s removed at the end. Also thanks for the info on Sprouts beans. I’m know they’re not everywhere but I have one close by…it’s my favorite store! I’m making my first large batch tonight. Do you think you reduce the syrup to half of the original volume? Two thirds? Thank you! I’m so excited to try this! OH! I’ll need to give several people their bottles early. I know you said above to give it to them but advise them to wait. So does that mean I should strain everything right before I give it to them or should I let everything continue to “brew”? Erin…so sorry for my late reply; I’ve been offline all day trying to get my home decorated for the holidays. And I would say about half volume; you’ll know it’s good to go when it coats the back of a spoon like syrup would. Hope this isn’t too late to help! Thank you! That’s about what I figured. I thought it might need to be fairly strong since the alcohol would thin it out. Using one of your previous posts, it sounds like you get about 2 x 750 ml bottles. So if I want 20% ABV, like Kahlua, I need 40% of 100 proof vodka and 60% coffee syrup. Reducing it to about half was prefect, not only in terms of amount, but a good, strong taste. I tripled the batch to make 9 x 500 ml bottles and I have it all in big bowls in my fridge. My hubby went to a local wine making store and brought me a case of flip top bottles – no shipping charges! I really appreciate all of your hand holding, and I can’t wait to try this in a couple of weeks!! I hope you have a wonderful holiday season, and I’ll think a thought for you as I sip my liqueur! Can you give me an approximate volume amount you should have after simmering? I tasted my reduction and the coffee flavor was not as strong as I thought it would be. Can you add more coffee at that point? Shoot I wish I could but I haven’t made it in a bit. But for me the rule is YOUR taste…if you think it needs more add some. You could probably even do that if you’ve started the process; just dissolve some more powder in hot water and add it to the mixture. I have never done that but this is really a simple process and should work fine. Good luck…and let me know! What’s the best way to drink/serve it? You can serve it straight up in cordial glasses or over ice in a lowball glass. I also like to add a touch of half and half to it and maybe even some vodka. Sort of a White Russian but with chocolate liqueur instead of Kahlua. Hope that helps! What do you suggest for a ‘storage container’? Yes, where do you get bottles with corks? I get most of my bottles online because I find a larger selection than locally. I’ve found some at World Market occasionally but it’s been awhile so I can’t recall if any were with corks or not. The last couple of years if I need bottles I go to http://www.specialtybottle.com/ – hope that helps! I bet that it would be better with rum instead of vodka. By dried espresso do you mean unused espresso grounds? In a pinch you can use regular instant coffee but just add a bit more. I’ve heard some folks use ground espresso but I have not so hesitate to say yes because without testing I wouldn’t be certain of the quantity required. I am making gifts for folks this Christmas one of which is herbed vinegar. Living in Florida, autumn and winter are our prime growing season. The thing is that I bought a ton of white wine vinegar and I don’t want to put the herbed vinegar back into the bottles. Several years back, my brother and his wife gave me a bottle of coffee liquor that was to die for, so I decided to use my wine vinegar bottles for coffee liquor. I just want to say that I visited several blog sites until I settled on your recipe. I’ve already made a batch of home made vanilla, and my beans are spent, so if I can’t find any at the local grocery store, I’m going to use vanilla extract. I am also considering going a different route than vodka, because that is what my vanilla is in. On the other hand, no one is going to be drinking the vanilla extract… or so I think. In any case, thanks for sharing this, and also your story about your Uncle Ed. That really touched my heart. Thank you Chris: I hope you love it. I don’t think there is anything more special that we can give for holiday gifts than something we made from the heart with our own hands. I hope you love it! 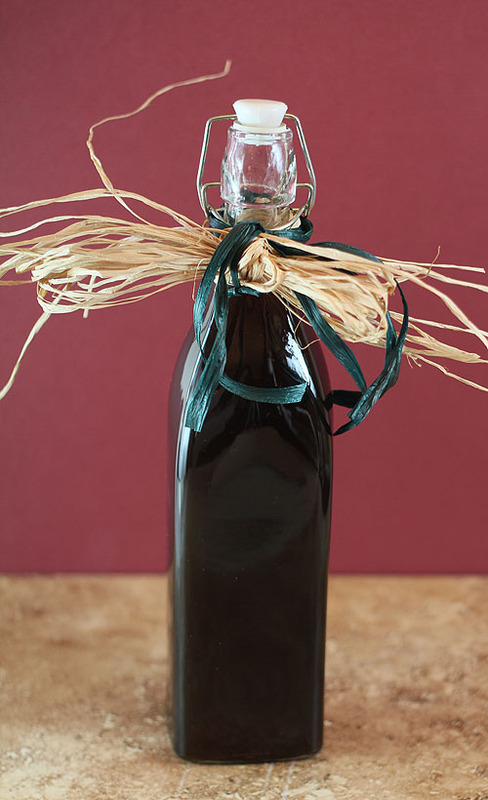 I am going to gift my coffee liqueur and was thinking about putting one of the vanilla beans in the bottle. The bottle would then come with your instructions on making Kahula flavored sugar. Thus the question: Would leaving the bean in the bottle further change the liquerur—or is all the vanilla flavor already extracted from the bean? I think the bean in the bottle would make for a homey touch but I don’t want to ruin the liqueur. Hmm. I can’t say if it would change the bean or the liqueur but if it were me? I would just tie the bean around the top of the bottle with some raffia or other rustic ribbon and include a card for it’s use. Good idea too…I gift this to friends and family every Christmas and keep the beans; more than I need. I shall now gift them their beans too! I am making vanilla extract this year to give out as Christmas presents. The recipe calls for the extract to steep for six months. I can’t see how keeping the bean in the coffee liqueur could hurt, but in all honesty, no one will know it is in there because of the color of the liqueur. If you are doing it for esthetics, I’d say why bother. If you want to ramp up the flavor of the vanilla, then go for it! I’ve done this recipe exactly as recommended. The month is not quite up and I can’t keep my sampling spoon out of the container! Still I’m wanting to play with the recipe and wondering what would happen if I substituted Rum for the Vodka (Rum seems to be a more natural pairing). Have you tried this? should I use the same portions? I have not tried rum Dave but why not? Would love your feedback; seems it would just add another element of flavor and richness to the end result and that would be good! I’ll give it a shot (pardon the pun) and let you know how it worked. I’ve made it with rum, vodka and brandy (special request). They are all good, and some friends like the rum and others prefer the vodka. The rum seems a tad smoother to me than the vodka. And the Brandy is actually pretty good. I have a friend that wanted the brandy Kahlua for her coffee. Some people use Everclear and not vodka and I won’t. It might extract more from the grounds but it is so harsh it’s not worth it! I want to try rum but have way too much in the liquor cabinet right now to make anything! I just made this thanks for the recipe. One question though, I think I might have burnt it a small bit and there is small bits at the bottom of the bottle. Would I be best leaving it in till after the 3 or 4 weeks and then running through a sieve? If it were me John I would strain out those bits now…if indeed any is burnt that would avoid having that burnt taste affect any of your product. Ok. I have ran it through a sieve to get the heavy stuff and slowly but surely its going through paper towels as its all I had to get the finer stuff. But its looking a lot closer to what the image has above. Sounds like a plan John. I usually use something caller Butter Muslin to strain my liqueurs but if I’m out, I’ll do a coffee filter or paper towels too…whatever works! Vanilla Beans are very expensive. Have you made this with Vanilla Extract? Do you know what the substitution measurements would be? I have 2 Vanilla Beans and plan to make a double recipe and may use Vanilla Extract to make up the difference, hoping that it doesn’t change the delicious flavor. Thank you, I’ll let you know. I’ll check Costco for the vanilla beans for next batch. Thanks for sharing. Adding a bit of chocolate seems to go along well because of the espresso. Nice post. Quick and easy … Cheap vodka, handful or two of coffee beans, sugar to taste. Remove some vodka from bottle, add sugar and dissolve to your taste, add coffee beans and leave to ‘brew’ until strong enough for your liking. Shake bottle at least once per weel. Drain off and consume! Is there a recipe for bailey’s? I made your kahula it was great thankyou. Merry Christmas to you too Dawn…glad you like it; enjoy! I use inexpensive vodka but not the cheapest…and the aging serves to mellow it out a bit. You can drink it at any time; you’ll just notice a smoother result with a bit of aging. Maybe could I use the Toriani Creme de Cacao flavoring syrup? I am definitely making this (and the cranberry one!) this year for gifts. They have recently privitized the liquor stores here, and I cannot find chocolate liqueur (along with a wide variety of other “specialized” liqueurs) anywhere. Can I use chocolate in some other form? Thanks! Oh I like to throw it in because I made it too…but you don’t have to. Thinking hmm, maybe just a spoonful of cocoa would work? I just think that coffee and chocolate both compliment each other so well but it’s not imperative. Hi there! I love this recipe! I was wondering where you got those great storage containers with the spouts? Also, I am also using this for Holiday gifts and there are so many bottles on the web I am not sure which ones to use. I want them to be pretty and decorative but I don’t want the recipients to have a hard time pouring. I was thinking swing top bottles but do you have trouble pouring with these? Let me know your thoughts. Thanks so much!!! The swing top bottles work fine but they are pricey to purchase locally so I found some when I made Limoncello that are much less expensive but their closure is just a simple screw top so I bought some shrink bands to go around the top for gift giving. Here’s a link to those bottles but this site also has the swing top which are more expensive but better suited for storing larger quantities. HELLO..I CAME ACROSS THIS RECIPE SURFING THE WEB LOOKING FOR SOME GOOD THINGS TO MAKE FOR CHRISTMAS. I MAKE MY OWN COFFEE/CHOCOLATE FLAVORED VODKA TOO! AND I USE INSTANT COFFEE—AT LEAST ONE CUP DISSOLVED INTO SOME WATER AND SUGAR. I WAS USING COCOA BUT AS U SAY—-TRYING TO FILTER IT OUT IS VERY TIME CONSUMING—-SO I AM GOING TO GET A CHOCOLATE BAR AND DISSOLVE IT INTO THE LIQUID AND SEE HOW THIS TURNS OUT THIS YEAR—-VANILLA IS A MUST ALSO—ONE YEAR I USED SWEETENED CONDENSED MILK AND IT WAS GREAT!! JUST KEEP IT IN THE FRIDGE AND SHAKE IT UP EACH TIME—-I LIKE HAVING SOME HEAVY CREAM HANDY ALSO FOR PEOPLE WHO WANT TO ADD IT—ITS SO MUCH FUN MAKING YOUR OWN CONCOCTIONS AND GIVING THEM TO FRIENDS AND FAMILY AS GIFTS —-HEY! U HAVE A GREAT DAY AND A GREAT TIME MAKING YOUR OWN RECIPES! CHEERS! 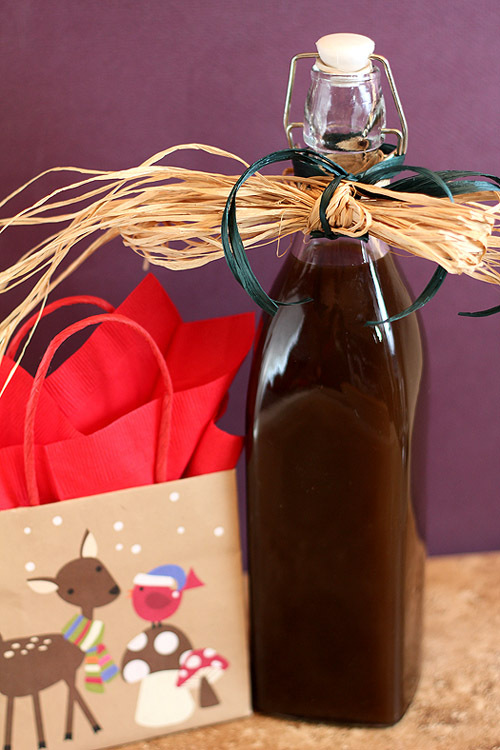 Yes, I just love making liqueurs and always make my own holiday gifts. This year I’m thinking it will be wine jellies…my new favorite thing to make and give as gifts. Can you use pure vanilla extract? Do you mean instant espresso or ground espresso? Kahlua, my all time favorite drink. I will definitely be trying this recipe out. I do have a question, though. Is there a time limit on how long a bottle will stay good for? For long-term storage would it be best to keep it in the fridge? Not that it will last long in MY house, lol, but in the event I make a whole batch to keep, does it ever go bad? I’ve not had mine go bad and I just used some yesterday that has been kept in a cool place but not the fridge; it was made in December. The alcohol serves as a preservative but I still take precautions to keep it cool and out of sunlight. I’ve never had one long enough for it to go bad either so I can’t give you a firm answer on that; I give the majority of mine as gifts so more often than not I’m getting requests for refills and no one is worried about spoilage! This recipe sounds absolutely delicious and I can’t wait to try it. I have a bag of whole bean espresso gourmet coffee that tastes great and I’d like to use that if possible. Please explain to me exactly how I would use this in place of your ground up espresso. Would I brew a rather strong pot of coffee and use that in place of the water or directly use the ground up Espresso? Since I’ve never made it using coffee beans Anthony I can only suggest that you brew some espresso with your beans and use that in lieu of all or some of the water and dry espresso. You can certainly tell from a taste after adding everything together if it will be strong enough. How much does this recipe yield? Would it be ok to bottle it right away and let it age in the bottle? Would i use a corked bottle or just a screw on top? Thank you for the recipe im excited to try it. I realized after I made mine I should have measures the final output but I was giving it for gifts and had it bottled before I thought of that. Still I would guesstimate the recipe made about 8 cups of final product; I think I doubled my batch since I was making holiday gifts…we had coffee liqueur everywhere! I think it would be OK to bottle right away…make sure everything is very well combined before you do though. I think better with a screwtop or something like I use which has a plastic type insert that is rimmed with a washer to keep the liquid contained. Good luck; please let me know after you make it. All your fault that I want to go back downstairs and make a Kahlua and Cream! I’ve been looking for this recipe for a long time! Thanks for posting it! You are most welcome…I’ve enjoyed making liqueurs; not just for me but they are great gifts too! Hi, I’m new to your site, and I’m loving it! How would you go about making this recipe with regular coffee? Would you brew a strong batch, and use that in place of water and espresso powder? I’m a bit picky when it comes to coffee, and I’d like to try making this with my favorite kona coffee. And suggestions would be appreciated! Thanks! Absolutely switch out the espresso with your favorite coffee. I did that for my taste but it would be perfect to add your own personal favorite; makes the effort even that much more yours. Can we use mostley white sugar? Yes, you can use all white sugar if you prefer. That’s more standard; I just prefer the bit more robust sugar so that’s why it’s in my recipe. So I’m one week in to having my homemade coffee liqour sit and it just seems very syrupy. Is this normal? Should I thin it out? And how/with what? If it seems too thick Nikki it might have been cooked down a bit too much in the beginning process. You can thin it down with a bit of water or add a bit more vodka. Liqueurs should be thicker than water but if it seems to thick for your tastes, certainly thin it out a bit. Just add some more liquid now and stir well. Coffee Liquor is always a great way to start a night!! Ok, I just made this and my apartment smells soooo good now! My roommates and I are so stoked for it to be ready in a few weeks! One question about storing it for the three weeks though….does it need to stay in a sealed container, or is it okay to open it every once and a while to smell it when I stir it? It’s fine to open it and stir it and of course you must do a taste test! The time element is really to mellow out the vodka; in a pinch Luke you can try it sooner than three weeks! Awesome, thanks! I’ll give it at least a week before doing a taste test, but after my taste test (or a few smaller tests) while I was cooking it, it was amazing! This is perfect! Ever since I visited my family over the holidays I’ve been wanting a good coffee liqueur recipe I could try out that was a bit more than the basic water, sugar, vanilla, coffee, vodka combination (my family is obsessed with Kahlua, as am I). I’m excited to try out your recipe, however the dried espresso might be a bit of a hunt! I’m sure it will be very well worth it though. It’s great Meaghan…I ‘think’ I love it more with Espresso and I have yet to see another recipe that cites cooking down the brew a bit either. It won’t ever be real thick but I do like a bit more than having it be the consistency of water! I could only get dry espresso from Whole Foods but last year asked my local market to try and get some and they now stock it. This is what I use if a name and visual will help. BTW…I now make my chocolate liqueur first and then use it to make the Kahlua. I’m on a role too! What do you mean by “dried” espresso? I would like to try to try to make this. Your recipe looks to taste far better than one I was going to make. I have all the ingredients…with instant coffee. Where do I find dried expresso? Cannot wait to make it and of course….test it! Worse case scenario just use a bit more instant coffee but if you can find the espresso? I think it combined with the chocolate liqueur is what take this over the top! Let me know if you make it; so far everyone has been delighted. The most important thing is to watch it closely as you make the syrup…getting it thick is important but not letting it burn even more so! I just made it! Looks and smells like it’s going to be gooood! I also made my own chocolate liquor that I put in to this recipe. Super easy…..Boil 2c water. Add 1c to 1c of sugar (to make a simple syrup) then the other 1c of water to 1/4 c of unsweetened cocoa powder (good quality). Combine the chocolate mixture with the syrup mixture, then add 1c vodka. It says to let sit in fridge overnight and then strain, then keep in fridge. Also, I used vanilla bean paste (Nielssen Massey) instead of vanilla beans to this recipe. We’ll see how it turns out! OK, now I’m making this. I mean NOW. Num hum. Jennifer.. your last sentence ” I used vanilla bean paste instead of vanilla beans to this recipe….do you mean you chocolate recipe or Creative Culinar’s Irish Cream??? Jennifer might not see your query but I can tell you that you can interchange vanilla beans with vanilla bean paste…it’s simply the beans in a sort of syrup so someone doesn’t have to buy the seeds. Is the “Cook time” at the top of recipe right (5 min)? Or is it really the 1 hour minimum for cooking (simmering) that is described in the directions? I can’t wait to get started making it! Thanks for the idea! Oops…I am sometimes my own worst editor! I’ve revised that cook time; it’s now the one hour minimum I indicate in the recipe. Thanks Chris! You are so right Julia; when getting drunk is more important than great taste! This is so cool! I definitely want to try this. I am definitely going to try this for the box! Yeah…it is so good. If you really do it, just watch it but let the first stage get really thick cause you’ll be adding the vodka to it. Mine even had some crystallized sugar on the side of the pan. I scraped it all off and put it all in the jug; it will melt into deliciousness I promise. LOVE THIS!! I’ll be honest, though, I’m not savvy in the kitchen and don’t want to take too many chances…so when you say ‘store in a cool, dark place’ is a refrigerator ok? Sure the refrigerator is fine; many would not want to put something in there for a couple of weeks so it’s not a requirement at this time of year; mine is out in the garage! Summertime or in warmer locales the refrigerator is the only solution. Good luck Sarah although it’s never failed me! You’re welcome Laura and if you make some you must let me know! What sort of container do you recommend for storage during aging? I just happen to have those big containers that I usually serve drinks from during summer parties but I’ve used any number of other things over the years. A washed out milk jug would be perfect or even an empty vodka bottle. I do recommend making sure it’s plastic and not metal. This looks great! I am going to do this for Christmas presents! Where did you get the bottles and any idea of price on them? I bought these at World Market; think it’s this: http://www.worldmarket.com/product/index.jsp?productId=4302061 – I think I paid a bit less when I bought them. They actually hold quite a bit; I’m going to bottle my gifts in the bottle that I put the cranberry liqueur into; a bit smaller and cute. I got those from The Container Store a couple of years ago but saw them at World Market when I was there 2 weeks ago. Thinking $4/bottle? Wow, my favorite liquor is Kaluha and I love Uncle Eddie so how could I not enjoy this recipe! Thanks so much Barb! Since I’m such an espresso lover, this is my kind of a gift. 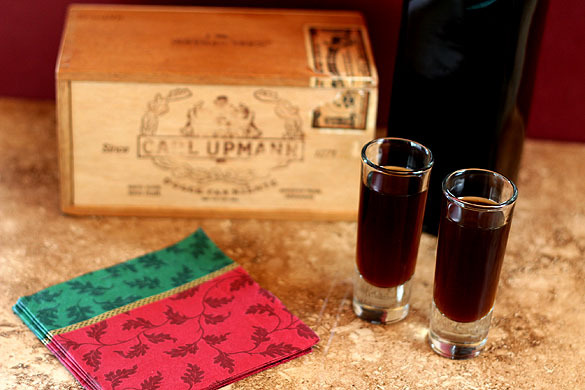 I suppose I couldn’t convince you to come visit and give me some lessons on how to make these delicious liqueur gifts? :)Looks absolutely tasty. You need no lessons for these…they’re way too easy. Now if you need some helping drinking them that’s a whole different story. Better late than never right? Just make sure you let the syrup get really thick because once you add the vodka it thins a lot. Mine will get to where I have to scrape some of the sugar off the side of the pan and it’s not a worry; it will all melt together in the brew! Fabulous! I’d love to be a recipient on your gift list this year 🙂 So great that you make your hits-I’m hoping to make some this year myself. Your cranberry liqueur looks amazing too! Happy Thanksgiving to you and your family! The same back to you…and you should try the liqueur; it’s really easy. I’m re-posting it next week with new pics. Makes a lovely cocktail with a sparking wine. This looks beautiful Barb. If your daughter works in the Denver store, I must say she does a fabulous job. Their displays are works of art and I always enjoy them. What a great gift. I too have started making holiday gifts and am going to post a recipe today. GMTA. 🙂 Even if it’s before Thanksgiving. She in the Park Meadows store but they have corporate guidelines for how everything has to look and stores are very similar. I know the woman who is the manager of that department in Cherry Creek; she is absolutely talented and driven; has won numerous awards. Boo hoo I want to be on your holiday gift list? Un-secret Santa? What tremendous, fabulous coffee liqueur! Wow I am impressed! And it does look so rich! Beautiful and lucky gift recipients! What a lovely post – and home cured bacon is an awesome gift. I am going to try out the coffee liqueur. Thank you Lynn for your vote of confidence; it’s going into the cure today; they better like it right? I think it is…and it is easy and while not what I want to call cheap since I don’t make gifts for that reason…I’m thinking I’ll get about 4 or 5 bottles of this for less than the cost of one bottle of Kahlua. Really can’t beat than can you? My biggest dilemma…wish gift recipients would return the bottles for refill! I made it today!!! Love the way it turned out. The only thing I will do when I make it again is to reduce it for more than the 1hr. I thought it was thick enough but then when I added the vodka it thinned it out so I would cook it for longer to get it a bit thicker! Can’t wait to try it in my coffee!!! So excited and glad you love it. Tastes amazing doesn’t it? The syrup does have to get thick because the vodka will then it again but I’ll tell you want. Better to have not cooked it quite enough than to have burned it. Many recipes don’t even thicken the syrup so I’m sure yours will be fabulous! I made an ice cream with Kahlua recently and a reader sent me a recipe for homemade coffee liqueur like this…but in my case, low carb. I definitely need to give this a try with my alternative sweeteners! If you get one developed that you like; be sure to let me know so I can include a link on mine, OK? P.S. I keep forgetting to tell you how much I like your Fall blog header! It is new(ish) isn’t it or am I just not very observant? Thank you Paula…one reason I loved the new header I made when I switched to CC is that not only is it easy to switch out photos when I feel like it but it’s also easy to change that top banner and some colors. I’ll be like Nordstrom’s; look for Christmas the day after Thanksgiving! I used to make home-made Bailey’s every Christmas (it’s great in your coffee too) and your recipe for this Coffee Liqueur is wonderful. Alone it would be a beautiful gift Barb but you adding it to your own home cured maple bourbon bacon and Biscoff cookies…now that makes for an awesome present that anyone would be a fool not to be overjoyed to receive. I admit; I have a very select list. Sister, dad, best buds and a couple of neighbors. I love that they so look forward to their basket each year. The bacon might be a shock…until they try it! This is brilliant. I’m glad you shared early so I can get a head start to give it some time to age. Thanks. I’m hoping I’ll get at least a sip (or two) of yours. Of course; I’m brewing more base even as I type. Anytime for you my dear. Oh my this drink looks amazing! I want one right now. Is it too early to have this for lunch? Great recipe, Wendy! Thanks for sharing! I am SO thankful you posted this recipe. I think this will be a must for holiday gifts and I think my family and friends will adore it. Thank you so much for the inspiration! Aly…your response and delight is exactly why I do share things from my kitchen; let me know if you do this…and enjoy! Ummm….Barb….can I get on your Christmas gift list?? I would love doing homemade gifts but it wouldn’t work for the folks on my gift list. Made me chuckle…people anxiously wait for my basket of goodies; except for my own kids. You would think I was trying to give them cow feed to suggest I give them a basket as a gift. Funny I guess but shows what they’re used to huh? This recipe is fantastic – I love that you have done all the experimenting for me!! I seriously need to make some of this – so much nicer to take a bottle of this than a boring bottle of wine!! Absolutely Nancy. I have to say I have never heard one complaint. Oh this is definitely close to my heart! Coffee love all the way and I loved reading your rec’s on what vodka to get! I’ll toast you with some Nelly…so happy for you! Oh awesome gift. I make my holiday gifts too but they are always baked good. I would rather have eatable gift then more junk in my house – so i definitely do not consider it cheap. I think this is a great gift idea. I prefer giving edible gifts; I don’t have to worry about sizes or colors or even returns! Each year they get a bit more complicated though…I mean it used to be a dozen cookies! I made several fruit liqueurs during the summer, using the loot my father brought daily from his ranch and it just made me want to make more and more:) I have your Cranberry Liqueur bookmarked and I’ll gladly add this one to the list! BTW, lucky are your friends and family to receive such thoughtful gifts! You don’t need a cold night…Kahlua is good no matter the temp. Glad you’re back home I bet huh? Must be so hard to worry about your Mom and still want to be home. Have a good Thanksgiving Lana; you deserve a break. I was wondering what this Friday’s cocktail would be and this doesn’t dissapoint. I love Kahlua in my coffee on a frosty winter day. It is just good for the soul. Your homemade Christmas presents make me feel like I may need to kick up my cheese straw offerings a bit. They are good, but they’re not Kahlua or your delicious bacon. I now have some in my coffee. Just a bit cause it is morning and all…but oh my is that good. All your fault and I thank you for that! Absolutely fabulous..and a great price to boot. I should figure it out, but I know this. One batch makes two bottles. I could do two batches from a 750ML of $15 vodka. Sugars and all…couple of bucks? Compared to $30+ for one bottle of Kahlua? Absolutely worth making. Well, I totally put some in my coffee this morning; so there! Hope you enjoy as much as we do. Thanks for the reminder – I made some of this months ago and have never tried it! It doesn’t have to be high quality since it’s added with other ingredients…for me it simply enhances the coffee a bit. I actually use the chocolate liqueur I make! thank you,but i am from bulgaria and don’t understand your quality in the recipes,do you understand me 🙂 maybe around 50 grams…it’s ok? ?